Mom spends all morning doing her chores, having to go around the dragon, which I'm sure would have moved for her, even climbing in and out of windows to get around. 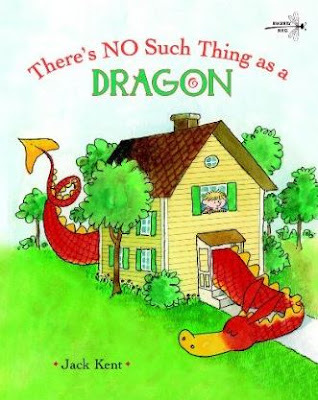 Poor Mr. Bixby, by the time he came home for lunch, the dragon had gotten big enough to move the house when it chased the bakery truck! "I don't mind dragons THIS size," said Mother, "Why did it have to grow so BIG?" "I'm not sure," said Billy, "but I think it just wanted to be noticed." Profound words from a little boy. I feel there are two "morals to the story". The one on the last page but also, a mother's, or a father's, words make a world of difference.